Anyone who knows me well, would probably tell you that I am quite the feminist. I often post articles on my Facebook page about closing the gap in men's and women's wages, about learning to cross gender lines, and also about supporting women's roles in math and science fields. I fight for equality for women everyday. I have not always been as strong of an advocate as I am now; it wasn't until I had a daughter that I realized how important this battle was for me to fight, not only for myself, but for her and every other woman and girl in this world. I remember very clearly the first time that my daughter came home from school and said that she was told by little boys in her class at school that she was not allowed to like the color blue because "That's not for girls." I also remember clearly the day that she came home and informed me that someone said she wasn't allowed to like superheroes because "That's not for girls." A few days later a little boy in her class told her that she should not like math because "That's not for girls." Each time she came home to me with this look of disappointment on her face as she told me what happened. I always responded to her very clearly that "Nothing is only for boys and nothing is only for girls. You are allowed to like anything that you want." When I was younger there were many times that I was told that something was only for boys, or alternatively only for girls, but I honestly always thought that by the time I had children it would stop. I thought that society would not continue placing stereotypes on children based on their gender. 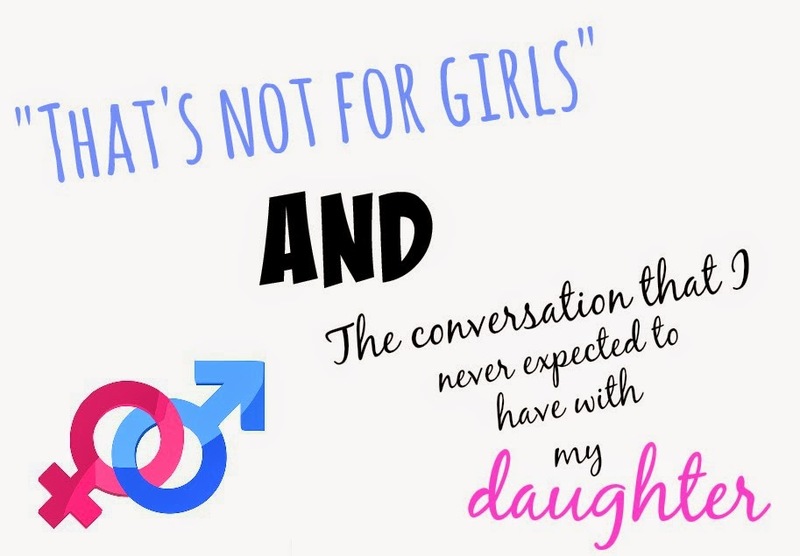 I thought that I would not have to have the conversation encouraging my child that things are okay for either gender. I was wrong, it hasn't stopped and I have had to have that conversation. I expected that with time society would learn acceptance and tolerance of interests, career paths, etc and not discriminate based on gender. I did not expect that when I had a daughter I would have to explain to her that when she gets older she is allowed to be an engineer, a scientist, or anything else that she wants to be even if society continues to tell her otherwise. I never suspected that my daughter would have to defend her favorite color, her love of superheroes, or her love of math. I never thought that she would have to defend her interests or choices because of stereotypes placed on her by society’s gender expectations. I have always made it a priority of mine to encourage my daughter's interests regardless of what they may be. I have been incredibly blessed to have a little girl who not only loves math and the sciences but also excels at them. She is only five and can add and subtract large numbers in her head, knows a bit about plant and animal cells, will dig in dirt for hours hunting for rocks, and enjoys doing science experiments. I am incredibly proud of her and her interests, and I am sure that you can only imagine how sad it makes me to see that there are people who still think maths and sciences aren't for girls and that I have to have the conversation with her explaining that they are. This conversation about gender stereotypes is one that I don't think that I could have ever prepared myself enough to have. It is also one that I hope I do not have to continue to have, one that I hope my daughter doesn't have to have with her children if she has them in the future. It is time to encourage children and their interests without regard to gender stereotypes. Great post! If you see my daughter's toys they are not gender specific. She has a lot of Jake and the Neverland pirate things (not of Izzy the female pirate) she hasmany Chuggington train toys. She even has cars and fire trucks. It's sad that these stereotypes start once they hit school. I am sure that your daughter will grow up as smart as you! I also encourage my children's interests because it is their life and parent's role is to support and guide them. Very sad that kids say that. Everyone should be able to do and like what they want. Girls and boys should be able to play together and like the same things. I loved reading this!